Everyone has it coming, an insult or a roast. Why then would we allow fantasy characters to get away with whatever they want? Simply because they bring joy to the world does not make them exempt from a proper comeuppance. Here at B.A.D Shorty we aim to insult, roast, destroy, and overall make fun of people, places and things that don’t actually exist. Whether I have a problem with them or not, I will make fun of them, because that is just who I am. This podcast is meant to be a shortform roast of your favorite childhood heroes. Whether it be Superman, Goku, Harry Potter, Courage the Cowardly Dog or anyone you can think of. B.A.D. Shorty is meant for the fans, so any ideas you can think of you can email us and we will do our best to do your hate justice. B.A.D. Shorty, giving a name to those feelings you never knew you had about things that never really existed. Alex Tsakanikas is a greek american comedian born and raised in chicago. Alex has been acting since he was 8 years old under the tutelage of legendary Greek director Takis Theotokatos, and picked up stand up comedy when he was in his twenties. His comedy stylings are a mixture of crash observations and fantasy theories. 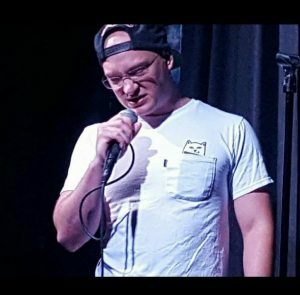 Alex is currently the host of the Bad Shorty podcast as well as the producer of Freaks and Greeks comedy showcase.